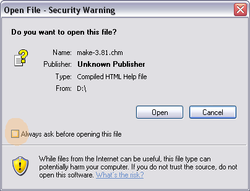 Does this window appear when you open CHM files ? This happend to me after upgrading to Internet Exporer 7. Uncheck the checkboxAlways ask before opening this file (Highlighted in the image above). I am using Windows 7 (64bit) . For me there is no "UnBlock" option in properties window. Did u find a solution? 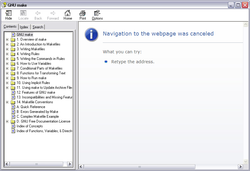 I'm not able to find the "unblock" option either..
On a client's Windows 7 computer and their Windows Server 2008 R2 x64, there is no Unblock appearing in the properties of my CHM file - yet it still will not show the content on the right pane with the same "Navigation to the webpage was canceled". Did anyone find a solution? Please don't repeat the Unblock answer. I found a simple but a head-scratching solution. Just right-click on the .chm file and click properties. Then press the Unblock button. 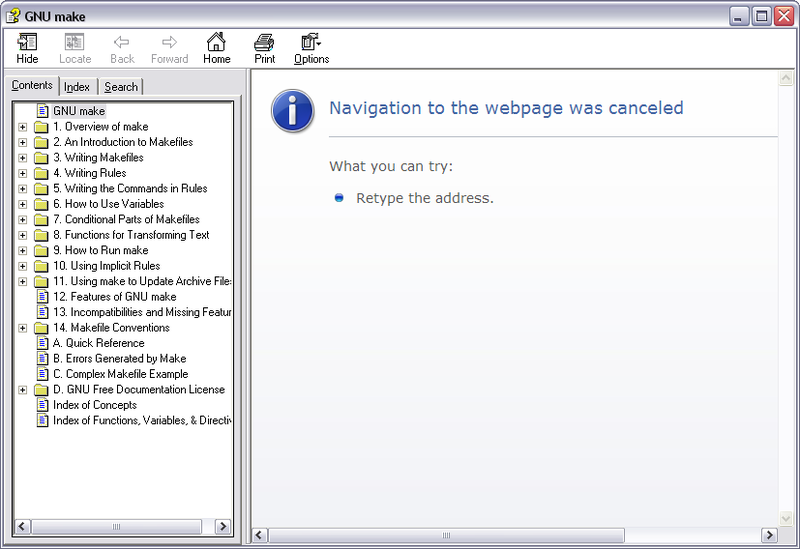 After that you should be able to open the .chm. Thanks! I don't get how MS thinks browsing a file is the same as opening it. It's after all their own file format. 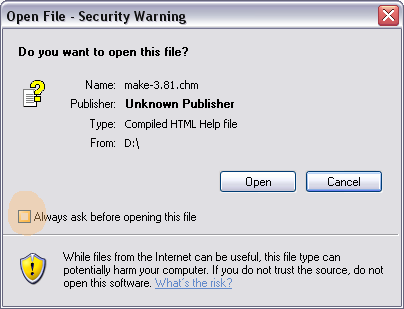 I have an application that is that creates a ".chm" file. On my local workstation the "Search" works great. But on other workstations the "Search" returns "No Topics Found". I deploy the hha.dll and hhc.exe with my application...Am I missing a supporting dll or something? Please help. Thanks CHM File navigation worked ! It worked for me too. Thanks for taking the time to post this. For some reason this did not work for me under Windows Vista Business. My problem was cause by windows blocking the help file. I had to go to properties and "Unblock" the file. I found nice instructions with screen shots on this site. I spent half an hour looking for a solution and downloading installers off of msft download center before i came across this article. Worked like a charm in windows 7.